30 Different area rugs in your choice of 32 colors, plus 25 new colors of cloth and cloth bleaching option. Files available for Alpha 12, 13, 14, 15, 16, 17, and Beta 18! November 28th, 2017: Fixed rugs eating furniture, yay. -Added 15 more color choices, see images above. 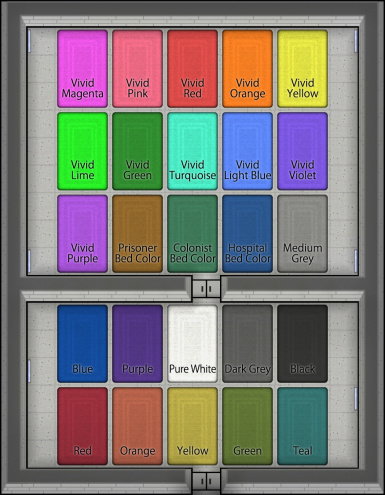 -This will not break your saves, you will however need to go into your stockpile(s) and checkmark the new colors. -Fixed not being able to sell rugs. -Fixed dyed cloth weight for caravans. -Added versions 15 and 16. -Known issue - bleached cloth sprites stay colored until stacked with other cloth, doesn't adversely effect usage, just appearance. -Removed requirement of tailoring (crafting) skill to make rugs, now it only requires artistic. Dying cloth still requires crafting. -Fixed the work amount values, each tile the rug covers now requires 10 work so the largest (7x7) rug now takes about 1.25 time the amount of work as a small sculpture. -This minor update should not break your saves. -Fixed work amount values for dying the cloth, it is now 10 work instead of 2. 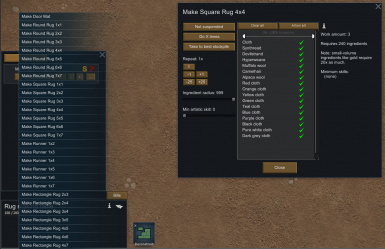 -Fixed incorrect material cost for 1x1 round and 3x4 rectangle rugs. -Updated to Alpha 14, no other changes. 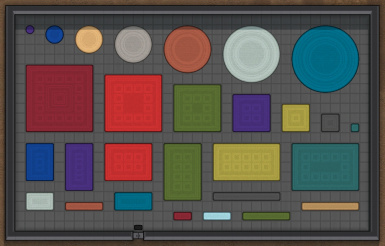 This mod adds 29 different area rug models to the game from tiny 1x1 doormats to huge 7x7 room filling monstrosities. They come in circle, square, rectangle, and also one wide runners for hallways. Unlock by researching carpets. 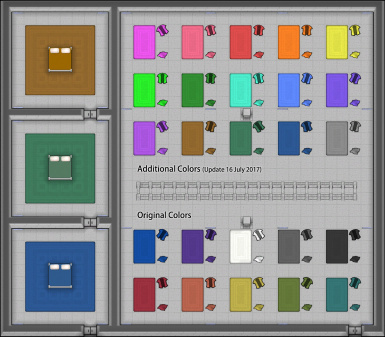 There are two new crafting benches: the dye barrel that takes default cloth and changes its color, and the rug crafting table that takes that colored cloth (or regular cloth, devilstrand, hyperweave, or wools) and makes them into the rugs. 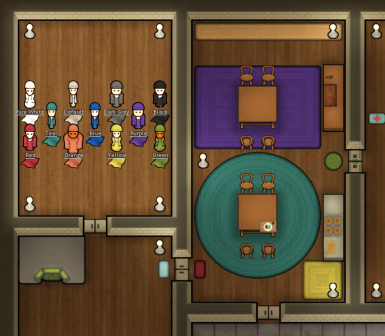 A cool side effect of this mod is that the new colors of cloth can be used to craft regular clothing so now you don't have to be content with everyone wearing light grey, if you want your colony to wear all purple you can do that! Visitors and raiders will also show up in the newly colored clothing and you'll be able to buy it from traders. Now the rugs.. they use artistic ability and have a quality rating, the higher the quality the more beauty it has. The larger the rug the more beauty it has. (I didn't want to punish people for wanting to use one big rug instead of 6 little ones in a room) They can be picked up and put back down and sold to traders if desired. 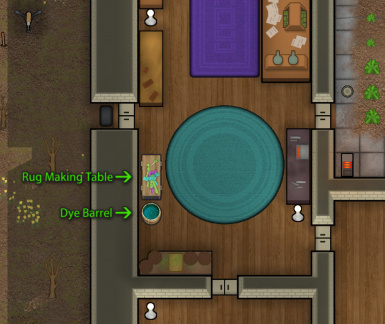 It is possible to get some >very< pretty rugs if you have a colonist with high artistic skill, and you can have a very beautiful base.. but keep in mind that the value of the rug will also be high and you will pay for all that beauty in more dangerous raids. Compatibility: I can't see why it would conflict with anything at all. 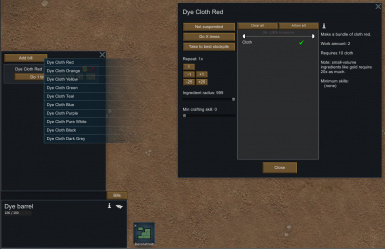 Mods that add crafted things from default cloth >should< also include the the colored cloth, you might have to have this mod first in your load order - this has not been tested though. Known issues: You can place the rugs under walls or even stack them on top of each other. I'm just happy they sit nicely under furniture so not worrying about this. Bleached cloth sprites stay colored until stacked with other cloth, doesn't adversely effect usage, just appearance. All graphics and some coding by AElflaed (Fisty), extra coding and testing by Darc Clan. This mod MAY be included in mod packs, altered or unaltered, please give us (Fisty and Darc) credit somewhere if you do so.